Briefly summarized, it hinted at a hidden race of monstrous beings which lurked somewhere among the remoter hills - in the deep woods of the highest peaks, and the dark valleys where streams trickle from unknown sources. These beings were seldom glimpsed, but evidences of their presence were reported by those who had ventured farther than usual up the slopes of certain mountains or into certain deep, steep-sided gorges that even the wolves shunned. Venture into the unknown with Call of the Wild, an expansion for Mansions of Madness! Five new scenarios and eleven double-sided board tiles plunge investigators into the mysterious backwoods, shaking the foundations of what players have come to expect. The keeper has even more surprises at his disposal, and at times must solve ritual puzzles and seek out clues. A focus on outdoor maps encourages non-linear exploration, and new Allies assist in combat while driving the macabre narrative. Survive the wilderness in Call of the Wild! I will start with the fact that I am a huge Lovecraft fan. I have read everything he wrote and subscribe to “hppodcraft.com” to get more insight into the material. I have purchased and played several Lovecraft themed board, card and roleplaying games over the years. So, my review comes from someone that comes in with a bias toward enjoying the material. In addition, this is an expansion. My assumption is that anyone reading this will already have the base game, or there would be little point in reading this. “Call of the Wild” is an expansion for Mansions of Madness and the base game is required to play. As with the base game, you adopt the role of an investigator tasked with solving a dark and dangerous mysteries that are set in the Lovecraftian world. The twist is that this expansion takes your exploits out of the environment you have become used to, the house and puts you out of doors. The only change this game adds in game flow is that the adventures are more free form than the ones in the base game. You don’t have to follow the same linear path to resolve the problems. You are not as bound to resolve problems in a specific order. As with the base game, they have done a great job of capturing the feeling of the subject matter. For me Mansions of Madness is like playing Call of Cthulu roll playing games in a condensed format. New Investigators, Trauma cards and Combat cards that can be used in any of the existing stories. New maps, since by this point all the expansions have taken place in the base game, this was a very large perk for me. As with the base game, I don’t think MoM is an easy game to learn. You have already gotten over the learning curve, by the time you get into this expansion, but only fair IMO to bring it up. As with the base game, replaying scenarios can be less fun, since you already would know one possible outcome. I feel this is an excellent expansion. It keeps the feel of the base game, so those looking to continue the experience they enjoyed will not feel cheated or be stuck relearning everything from scratch. By the same token, it adds enough new material, that I feel like I got another game, without having to pay for an entire game. If you loved the first, I certainly feel you will enjoy this new chapter. I know we are and look forward to more expansions in the new environment! 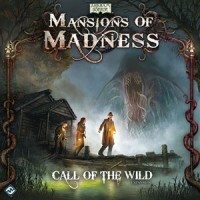 Add a Review for "Mansions of Madness: Call of the Wild"